On First Take Fridays a number of authors around Meeple Mountain give short first takes on games that are new to us. This week we have takes on Forum Trajanum, Wendake, and Hyperspace. Like any brilliant Stefan Feld game, Forum Trajanum has a paper-thin theme that lets players feast away on point salad (clearly the only kind of salad you can make friends with). Before its Essen release, I had heard that this game was a spiritual successor to another Feld hit, Trajan, and I was reluctant. It took me a few plays to appreciate Trajan because its design felt like many mini games mashed together into one game whereas I wanted it to be a more comprehensive experience. I found what I was looking for in Forum Trajanum. It’s difficult to only briefly describe how Forum Trajanum is played because there are so many steps in a round and a cycle and, not surprisingly, so many ways to score points. Each player has their own board with a 6×6 grid with all spaces covered in facedown resource tiles. Each round, players will simultaneously remove a facedown tile from two of their rows or columns as indicated by cards revealed at the beginning of the round. From the two revealed tiles, a player will keep one and then pass the other to the player on their left. At the start of a player’s turn, they’ll select one of the two tiles and gain the pictured resources (which are often workers). Next, they can spend the appropriate workers to construct buildings on their 6×6 grid. Since players begin the game with their grid filled with facedown tiles, each round they’ll be freeing up two spaces. The constructed building will then activate and move a player up one of the corresponding tracks or allow them to send an envoy to the Forum. Why? Well, to score points of course! 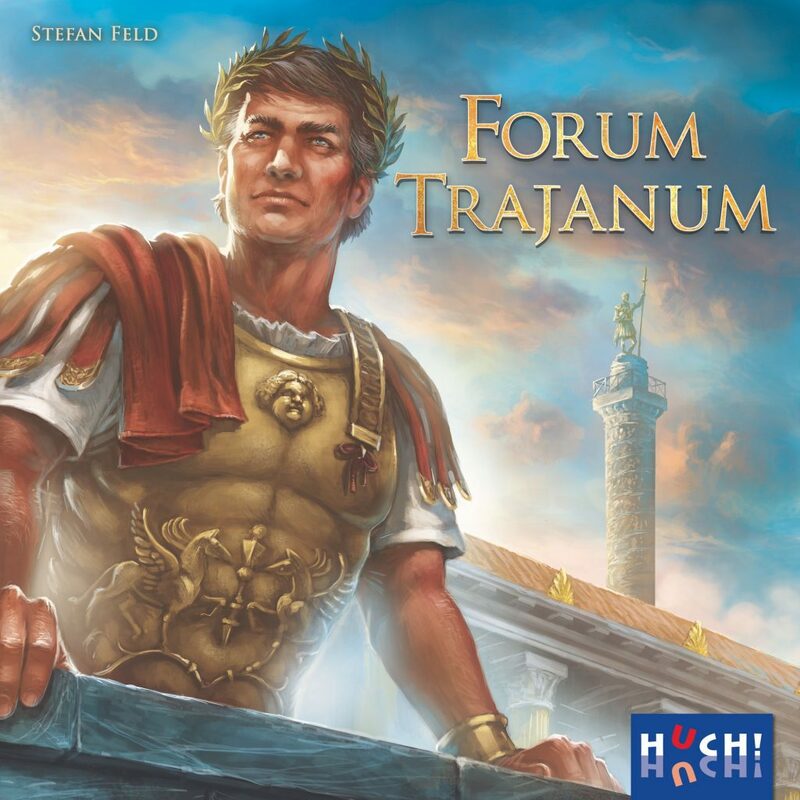 Unfortunately, a brief and simple overview of Forum Trajanum doesn’t do its gameplay justice. When I first started playing modern board games, Stefan Feld was one of my favourite designers, but sadly I’ve found that with each year that passes, a little of that love is lost. After just one play of Forum Trajanum, my faith in Feld as a designer has been restored. Of all the Essen games that I have played so far (and there have been many), this is my favourite. Read more from Ashley Gariepy. 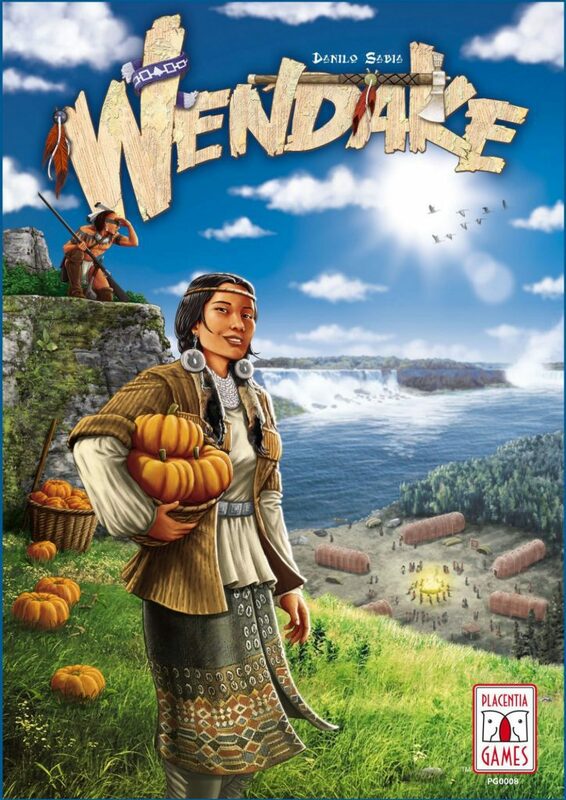 Originally launched on Kickstarter in 2016 and recently picked up by Renegade Games, Wendake finds its players taking on the roles on tribal chieftains in the United States in the mid 1700s during the time of the Seven Years’ War between England and France as they work to increase their tribe’s presence and influence within the region. The game uses a unique action selection system to achieve these goals. Each player has their own player board which is comprised of 9 tiles depicting different actions that they can perform; actions such as hunting, fishing, trading, exploring, and farming for instance. On their turn, the players will select one of the actions in their display to perform and then place a marker on top of the action to show that it has been selected. On the next go round, they will select a second action followed by a third on the go round after that. However, the players can’t just choose any actions willy-nilly. Instead, the three actions all have to be in the same line either horizontally, vertically, or diagonally. Then, at the end of the action selection phase, the bottom three actions will fall out of their displays and the players will be able to choose from a selection of upgraded actions tiles to replace one of the removed tiles with. The newly chosen tile and the two remaining ones are shuffled and then placed back into the display in the top row. The game is played in this way over the course of several rounds and then the game comes to an end. There are four different scoring tracks that are divided randomly into pairs. The players’ final score will be the sum of the lowest score from these two pairings so it behooves the players to strive to maintain a balance between the different scoring areas. The person with the highest score wins the game. This is a high level overview, of course, and there are a lot of small details that I am leaving out for the sake of brevity. Suffice to say, there’s a lot going on in this game and it can seem a little intimidating at first. Once you get going, though, things fall into place pretty quickly. I really enjoyed Wendake and I’m glad that I was finally able to add it to my collection. It wasn’t the easiest game to learn, but it certainly offered an interesting challenge and I cannot wait to play it again. Read more from David McMillan. I was very fortunate to get to play a prototype of Sandy Petersen’s newest Kickstarter phenomenon and boy am I excited to get my hands on the final product! 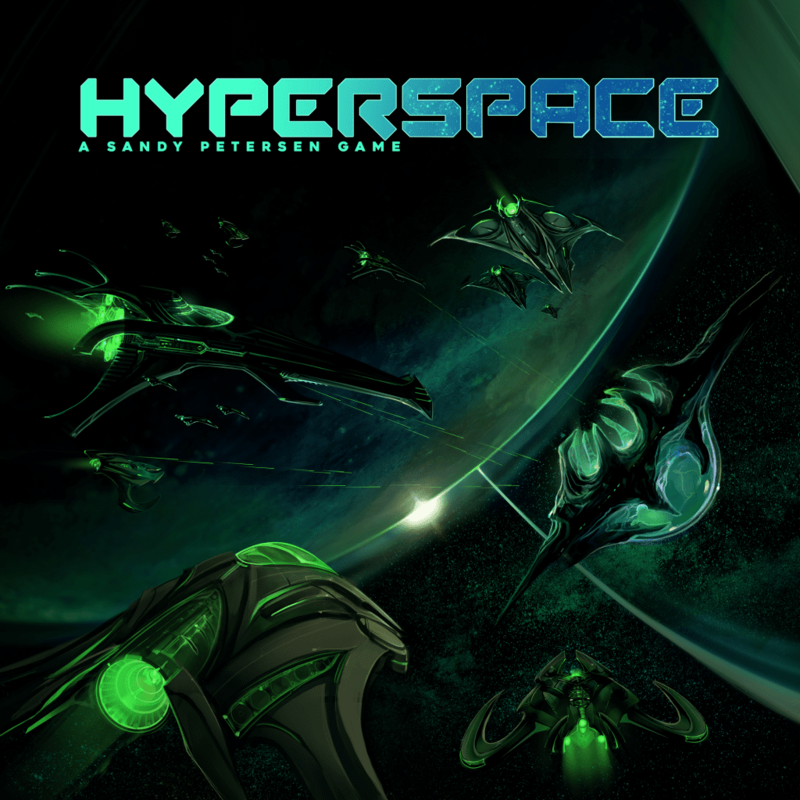 Hyperspace plays like a meaty 4x game of space exploration and combat but does so in the time frame of 1-2 hours. There are a total of 20 different asymmetric factions that are competing to be supreme leader of the galaxy. One of the high points that sold me on Hyperspace is that there is no upkeep phase (which bogs down many games of this genre). You get three actions and move on. Turns are quick, clean, and enjoyable. I also liked how combat worked in this game. During fights, all units roll dice based on the unit. The fun thing is that the attacker gets to determine where damage goes, not the defender. The classic strategy of hiding your powerful supership behind a bunch of damage sponge fighters will not work in Hyperspace as you must plan carefully how and when you will attack. Hyperspace turns what you know or expect about space 4x games on its end and I love that it is a fresh take on one of my favorite genres. Overall, Hyperspace is an easy game to teach but is not lacking in strategy or replayability. This game replaces Twilight Imperium for me as my go-to 4x space game. Read more from Tyler Williams.